In today’s world there are a number of reasons why a building can collapse. An act of terrorism, a leaky gas main, earthquake, flooding, landslides/mudslide, hurricanes, tornadoes, or an avalanche can cause even a brand new, sound building to collapse. Regardless of why the building collapsed, there are certain ways to survive and to escape the building. One of the most important things you must have is an emergency plan that covers the collapse of your home or where you work. This plan should cover what to do if there is a partial or a full collapse of your home or workplace. If you live in a high risk area where buildings have been known to collapse, it is also to your advantage to do drills at least twice a year. The drills should cover finding an easy way out as well as scenarios in which you are totally cut off and there is no escape. In the event of building structural damage, taking care of your family at a time where food, clean water, health care, and modern amenities are in short supply is a high priority. There should be enough supplies to feed everyone in your family for a minimum of 72 hours. Hopefully this will allow time for the authorities to organize disaster relief efforts. These supplies should be kept in airtight/watertight containers of about a 5 gallon capacity. This makes them easier to use while you are trapped, and also while taking them along during your escape and on the journey to a safe location. Water – At least 1 gallon per person per day. Non perishable food – Canned or dried fruits, vegetables, and meats. Portable Radio – With AM/FM and Weather bands. Waterproof matches and emergency fire starters. Emergency poncho with hood for each family member. 1 pair work gloves for each member of the family. Plates, pots, pans, and collapsible drinking cups. Enough water purification tablets and filter straws to get you through the disaster. Health, sanitation, and hygiene supplies. Camp stove to cook outdoors. Paracord, tarps, and duct tape. Important phone numbers and Cash. Have extra clothing and shoes for each member of the family. Be sure to have any needed special medicines or other medical supplies for any members of your family. Dry food and canned food for your cats or dogs. Any medicines or vitamins that they take daily. Enough water for your pets to drink and a collapsible water bowl. Depending on the number of employees in your work area, there should be enough supplies to meet their needs. Office emergency kits usually contain the same supplies that you would have in your family kits. Office emergency kits should have approximately 72 hours of food, water, and filtration supplies. The supplies should have at least a five year shelf life. If you live in an area that avalanches, landslides, earthquakes or other acts of nature, they can totally wipe out a town, leaving nothing but collapsed buildings in its path. Aside from a larger emergency kit, it is wise for you to have a personal survival kit that you can keep with you at all times. For men this survival kit should be kept in a small belt pouch. Ladies can carry this complete urban survival kit in their purse. The following is a list of the minimum items that your kit should contain. Small LED flashlight to see in the dark. Classic Swiss Army pocket knife. A small compass and an area map. If this was an older building the air quality could be dangerous because of lead paint dust and asbestos particles in the air. Another problem would be metal ripped and torn apart leaving sharp edges that could be lethal. Open electrical circuits that are exposed in the debris are also very dangerous and can kill people and animals that come into contact with live electrical wires. To make matters worse, broken water pipes and sewer pipes can cause flooding and expose you to any number of dangerous diseases. You might have survived the initial collapse, but the above-stated dangers could kill you or critically injured you before help could arrive. Several sets of heavy work gloves, and goggles for eye protection. A standard crowbar that can be used for general prying and leveraging. Remember the longer the bar the better the leverage. The crow bar should have a hook on it that can be used to pull materials out of the way that might be otherwise not safe to handle with a gloved hand. A small sledge hammer or heavy framing hammer. These hammers can knock metal or wood studs out of the way as well as open locked doors if encountered. For safety sake, you need to be wearing heavy gloves and safety goggles. Most importantly you must have adequate space to swing these tools. Remember, use the weight of a tool and do not muscle it. These hammers, like axes and hatchets, required discipline to use. It is almost impossible to redirect them if swung in a path in line with your body. When used incorrectly, they can be as dangerous as the situation itself. 18 inch bolt cutter and other heavy duty wire cutters. They should be insulated from electrical shock, be sharpened, and have handles as long as possible to fit into your emergency tool kit. These tools would be very helpful in cutting through all types wire messes that might be obstructing and blocking your escape route. A good hacksaw or a multi-purpose blade can cut through objects such as sheet metal, heating duct work or aluminum siding. Also have extra blades for the hacksaw or multi- purpose saw. These saws can cut through objects more effectively than heavy duty snips. They all leave behind clean cuts, which limits the risk of lacerations if re-entry or repeated trips are necessary. An ax with a non-conducting handle. If a hole is needed in a flat surface this ax should be used. Punching through a sheet of plywood or through a roof is easier when a cutting edge creates the initial hole to saw through. Warning! Be careful when penetrating any wall, ceiling, or floor, as conditions on the other side may be more dangerous than those on your side. Remember to look, listen, and feel before breaching any wall with an ax. A headlamp allows you hands-free use of a light source. If there is a gas leakage problem, it would be to your advantage to have a head lamp or a flashlight with non-exploding bulbs, or one that is rated for the mining industry. Also don’t forget extra batteries and bulbs for your portable light systems. There should also be a set of screwdrivers that could be used for disassembling objects and getting them out of the way. In most cases there will be little or no warning that a collapse is imminent. The most important thing is for you to stay calm and to get out of the building as quickly as possible. Do not hesitate to go out of a open door or window if that is your nearest exit. If you are in a building with an elevator, do not use the elevator, because the elevator is a death trap! If the building were to collapse, the elevator could jump off its pulley system or snap the elevator cables. Either way the elevator would free fall to the bottom of the elevator pit, most likely to your death. If the elevator was to get stuck in the elevator shaft, you and anyone else would be stuck in the shaft with a building falling down around you. The elevator may stay at the level at which it is stuck until rescue operations can reach you or the elevator shaft may collapse like they did in the World Trade Center. You will be much safer and possibly live longer using the stairs. The sad thing about the World Trade Center collapses, was the employees and visitors were conditioned to take the elevators not the stairs. These people did it every day and never thought to use the stairs in an emergency. In this emergency, if more people had not panicked and used the stairs, even from the higher levels, more people could have survived. Instead, during the cleanup operations, the elevators were found packed with human remains. 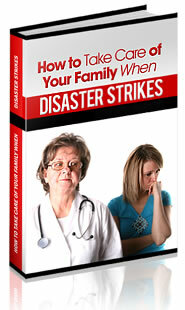 Usually disasters occur very quickly and it’s imperative that you act as quickly as possible. You could be stunned, disoriented, or full of adrenaline. Most people are frozen by fear and begin to act irrationally. Take a second and assess the situation. You may only have a few seconds for escape, and making the wrong move in a crisis could be your last. Check to see where the nearest stairwell is and try to use that to get out as fast as possible. Remaining calm throughout the building collapse is easier said than done. Conserve Your energy and use it only when you hear a rescue party is near. One of the biggest mistakes that people do is to scream and shout for hours only to quickly become exhausted. Not only does this raise your heart rate and breathing, but you will be inhaling more toxic fumes, dust particles, and other micro debris that can quickly have a negative effect on your lungs and airways. For many years the best way to save your life in a collapsing building was the use the old “duck and cover”. In this life saving system an individual will get under a heavy item like tables, beds, furniture, and mattresses. The idea was that falling debris would fall off the furniture and land on the floor. The truth is that during the collapse of the building, the ceiling or the walls would come straight down crushing the people who are hiding under these items to death. If you cannot get out, look around for a sturdy piece of furniture that will not compact if something lands on it. Some good furniture types include a heavy desk, sofa, or large overstuffed armchair. For safety sake, do not get under any of these. Rather, position yourself next to them (this area is known as the triangle of life), lying on the floor in the fetal position. The less the object compacts, the larger the void, and the greater the probability that the person who is using the void for safety will not be injured. This is also a spot where it is unlikely that debris will strike you. The furniture will be able to support a collapsing wall or ceiling and create a space adjacent to it where you will be relatively safe. You may get injured, but the chances are that you will come out of the wreckage alive. In most disasters, fire can quickly break out and spread throughout the building. Smoke inhalation can slow you down if not kill you. Remember you may only have a limited amount of time before the fire spreads and cuts off any remaining exit options you have. Stay low to the ground and avoid smoke inhalation at all costs. Wet a cloth or your shirt to cover your nose and mouth. This will help filter some of the smoke. Plastic moldings and metal fumes are often released into the air during a fire, they are extremely toxic and must be avoided as much as possible. Things to do before opening doors. Sometimes people accidentally assist the spread of the fire because they open doors when trying to escape. Always use the back of your hand to touch the door to see if it’s giving off heat. Touch the top, middle, and the bottom of the door, as the fire could be on the ceiling or the floor. If the door is hot avoid opening it, or you may cause a backdraft that will only accelerate the spread of the fire. If you find yourself trapped because a fire is below you, or you have no other exit, check the stairwell first. Find out if there is any smoke billowing in the stairwell or if something is blocking off the smoke from entering through the cracks in the door. Most stairwells in modern buildings are fireproof and can improve your odds of survival. Fire rescue teams will also be able to reach you faster than if you were in random rooms in the building. If there are large amounts of smoke in the stairwell you will need to avoid the stairwell or risk dying from smoke inhalation. What to do if you are stuck under debris. After the building has stopped collapsing, you may find yourself stuck under an object or trapped under a pile of the debris. Your main goal should be attracting rescue workers and dogs to your location so they can help get you out. Use a flashlight, or a cell phone to signal rescuers. In the dark environment of a collapsed building rescue workers will be trying to pick up on flickers of light or anything out of the ordinary. If you can reach your cell phone or flashlight you can create a signal to help speed up your rescue. Light can travel a long way and can be seen quite easily especially by dogs or robotic cameras. Loud noises such as from a high pitch whistle or air horn can cause the building to start collapsing again. Use sound with caution, and try to use light for signaling whenever possible to avoid this problem. That being said, if you must, then tap (try not to bang) on pipes or the floor. Rescuers and rescue dogs are trained to listen for any sound. Tapping on a large pipe will result in an echo moving throughout the pipe. This means that even if you are trapped well below the surface rescuers can hear the beat on the pipe and figure out how to get you out. Rescue dogs use their sense of smell, but also their sense of hearing to pick up on the subtle clues. So if you possibly can move your fingers or tap on the walls or pipes you can improve your odds of being found. You must avoid unnecessary movement at all costs. If you know you are stuck under a large object or under a pile of the debris, you should try to avoid any unnecessary movement. If you need to move for any reason, try to keep your movements slow and steady. Do not under any circumstances make fast jerky movements or you could possibly bring down large amount of debris, which could worsen injuries or even kill you. Be careful of what you breath in the collapsed building. There will be likely quite a bit of dust from the collapse of the building. To protect you from the toxic dust and sharp debris, cover your mouth eyes and nose with a handkerchief or some of your clothing. It is very important to stay as still as possible to keep from stirring up more dust. If you breath in such debris, you may risk an internal infection or other breathing complications. Wooden buildings are the safest type of construction to be in during an earthquake or other building collapse because wood is flexible and moves with the force causing the collapse in the first place. If a wooden building does collapse, large survival voids are created. Also, wooden buildings have less concentrated crushing weight. Brick buildings will break into individual bricks. Bricks will cause many injuries but less squashed bodies than concrete slabs. If you are in bed when a building begins to collapse, simply roll off the bed (but do not go under it). A safe void will exist around the bed. Do not linger under a doorway. If you stand under a doorway and the doorjamb falls forward or backwards, you will be crushed by the ceiling above. Get near the outer walls of the building or outside of them if possible. It is much better to be near the outside of the building rather than the interior. The farther inside you are from the outside perimeter of the building, the greater the probability that your escape route will be blocked. People inside of their vehicles are crushed when the road above falls and crushes their vehicles. This is what exactly happened with the slabs between the decks of the Nimitz freeway. These victims of the San Francisco earthquake all stayed inside of their vehicles and they were all killed. These victims could have easily survived by getting out and sitting or lying next to their vehicles. All of the crushed cars had a void of 3 feet high next to them, except for the cars that had the columns fall directly across them. If you work inside of a newspaper office or other offices with a lot of paper, remember that paper does not compact. As weak as paper may seem, it can make a safe place for you to take shelter behind. Don’t to panic! In those cases where people panic, there is a greater loss of life and more people injured than if they had kept a cool head and thought things out. Remember after the building has settled, rescue workers will begin to search what is left of the collapsed building or buildings in the hope of finding survivors. If you make and follow a survival plan, your chances of surviving the incident will be greatly increased.